Michael Cohen has agreed to testify behind closed doors in front of the House Permanent Select Committee on Intelligence, according to a statement from the committee chairman, Rep. Adam Schiff (D-CA). "I want to thank Michael Cohen for agreeing to appear voluntarily before the Committee for closed testimony on February 8, 2019," the statement read. Trump's former attorney and long-time fixer had initially accepted an invitation to testify during an open session before the House Oversight and Reform Committee on Feb. 7, saying he looked forward to "having the privilege of being afforded a platform with which to give a full and credible account of the events which have transpired." But, last Wednesday, Cohen announced that he was delaying the appearance out of concern for his family's safety. Cohen began to have reservations about the appearance following a series of public attacks by President Trump against him and his family, sources close to Cohen told ABC News earlier this month. In a Fox News interview on Jan. 12, Trump called Cohen "weak" and accused him of lying to prosecutors to get a reduced sentence. Schiff said in his statement Monday that the attacks on Cohen "must stop." "Mr. Cohen has relayed to the Committee his legitimate concerns for his own safety as well as that of his family, which have been fueled by improper comments made by the President and his lawyer. As I've previously stated with my colleagues, Chairmen Elijah Cummings and Jerrold Nadler, efforts to intimidate witnesses, scare their family members, or prevent them from testifying before Congress are tactics we expect from organized crime, not the White House, Schiff's statement read. "These attacks on Mr. Cohen's family must stop. Federal law prohibits efforts to discourage, intimidate, or otherwise pressure a witness not to provide testimony to Congress. We will continue to work with Mr. Cohen and law enforcement in order to protect Mr. Cohen and his family." Cohen has also just hired a new legal team as he prepares for the Congressional testimony and continues to engage in discussions with the special counsel, the U.S. District Court for the Southern District of New York and New York State authorities. He is also bidding adieu to Guy Petrillo, the former head of the criminal division of the Southern District of New York, who represented Cohen throughout his criminal case in New York and in his interviews with the special counsel's office. Cohen's hiring of Petrillo last summer coincided with his public breakup with Trump and his exit from a mutual defense pact with Trump and others. In a statement on Monday, Cohen's legal adviser, Lanny Davis, announced that Cohen had added two Chicago-based criminal defense attorneys, Michael Monico, a former assistant U.S. attorney for the Northern District of Illinois, and Barry Spevack, a criminal defense lawyer with 38 years of experience who has "co-authored a leading criminal law text." "We look forward to helping Mr. Cohen fulfill what he has told us is his only mission - to tell the truth as he knows it and to turn the corner on his past life and taking ownership for his past mistakes by cooperating as best as he can with all governmental authorities in search of the truth," Monico and Spevack said in a joint statement. Cohen did not have a formal role in Trump's 2016 presidential campaign, but his involvement in a myriad of controversies would have been inquired about during the public testimony. In December, Cohen pleaded guilty for lying to Congress about the timing and discussions about a proposed Trump Tower building in Moscow. 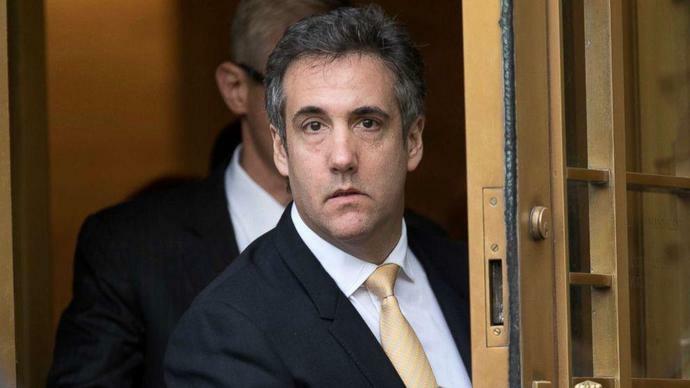 In August, Cohen also pleaded guilty to financial and tax crimes associated with his personal business dealings, as well as to campaign finance violations for his role in hush money deals. ABC News' Eric Avram, Julia Jacobo, Jim Hill, Eliana Larramendia and George Stephanopoulos contributed to this reported.